The most valuable ride-and-handling option available on 1989-1995 Corvettes is RPO FX3 "Electronic Selective Ride and Handling". 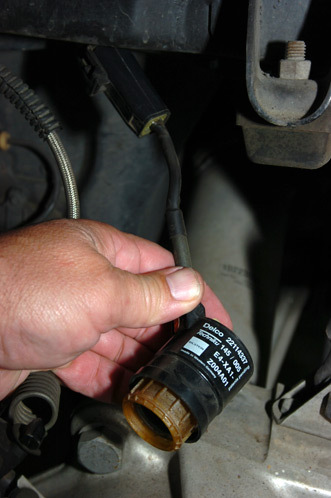 Known by many Vettesters as "adjustable suspension" or by its RPO number "FX3", GM engineers called it "Selective Ride Control", "Selective Ride" or just "SRC". Selective Ride's core is four, Bilstein, electrically-operated, ride-adaptive shock absorbers; ok, real engineers call them "dampers". "Ride-adaptive" means the shocks adapt their damping to changing vehicle dynamics while the car moves. Along with the dampers, SRC has an on-board computer to control them, a center console selector switch and the wiring harness that links all this hardware. In the early-'80s, Bilstein designed this system for the $230,000 (today, about 460 grand), limited-production, Porsche 959. Clearly, Bilstein wouldn't profit much nor even recoup its development costs on such a niche-market vehicle. 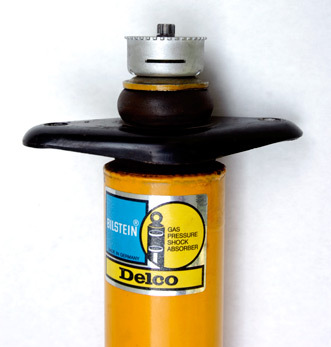 Bilstein also supplied the fixed-valve, high-pressure, gas-filled dampers introduced on C4 for 1985. About the time the first 959s hit the road in Europe, Chevy was working on a 1989 project called "King of the Hill Corvette". The Bow-Tie guys wanted a technologically-advanced suspension to go with a four-cam V8 and a six-speed they were putting in this up-level C4 which was eventually branded "ZR-1". According the Dave McLellan, Corvette Chief Engineer from 1975 to 1992, the reason he envisioned SRC for the ZR-1 was simple: it would enlarge the car's performance envelope with improved handling in combination with better ride. The only way that could happen was if the dampers were ride-adaptive and controlled by some vehicle dynamics parameter such as speed. Scott Allman, Lead Engineer for Corvette's ride-and-handling development from late 1987 to 1994, told us in an interview, "At low speeds with the Gatorbacks (Goodyear's first generation, ultraperformance radial tire on '84-'91 Vettes), C4's rode like trucks. With Z51 and Z52, we were getting a lot of complaints about ride harshness. 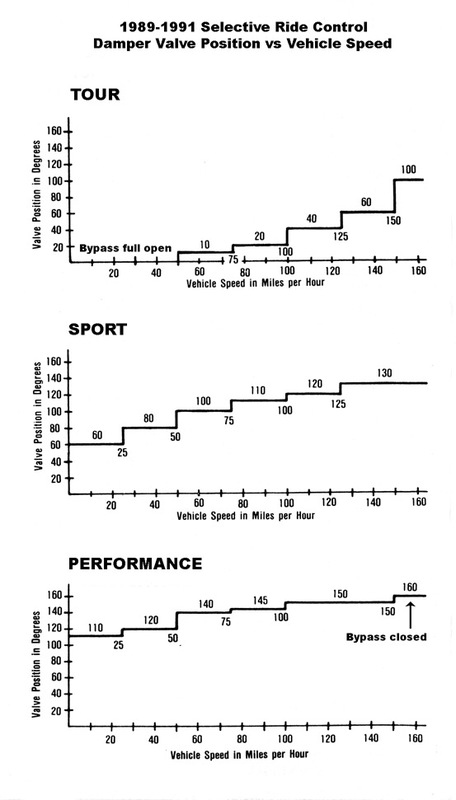 We were doing everything we could to take control authority out of the shock absorbers to improve the low-speed, rough road, ride and handling. When you do that, but then go autocrossing or road racing; the car is all over the road. It's difficult (with fixed-valve shocks) to get enough control authority to have proper damping at high speed without negatively impacting the low-speed ride and handling. 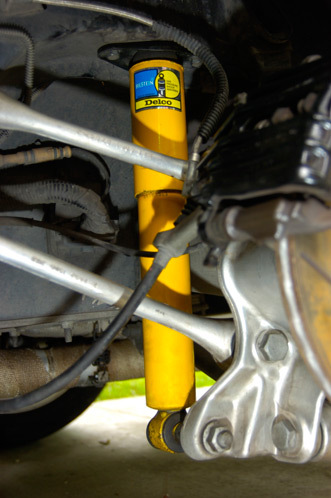 "Bilstein had talked to us about this variable damping with six steps," Allman continued. "The idea was at low-speed, we could have a lot less damping than we needed at high-speed." The rest, as they say, is history. The Chevrolet/Bilstein partnership repackaged the damper hardware used on the Porsche 959, recalibrated the controller software and developed the system for C4. 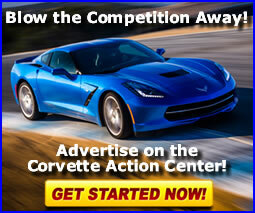 When ZR-1 slipped a year, SRC was introduced as a Corvette option for model year 1989. The King-of-the-Hill finally arrived a year later with Selective Ride as standard equipment. Between MY89 and '95, 35,614 C4s, including all 6,939 ZR-1s, were built with SRC. 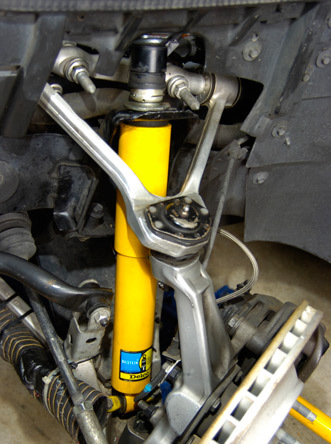 A front shock absorber on a C4 with Selective Ride. ...and the rear shock on the same car. Not marketing-driven gimmickry, Selective Ride was a technical milestone for a high-volume car in the late-'80/early-'90s. 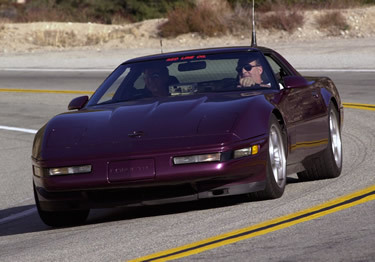 Its chief advantage, a computer-controlled, wide damping bandwidth, made any C4 so-equipped ride nicer in normal driving situations and handle better, when driven hard, than Corvettes with standard dampers and even other cars with the non-computer controlled, bi-state systems of the period. SRC shocks evolved from existing Bilstein high-pressure, nitrogen-filled, damper architecture. Adjustably was accomplished by adding a variable bypass which, as the shock piston moves up (rebound) or down (compression), allows shock oil to bypass the piston's valve stack. The more oil bypassed, the less suspension movement is damped. The less oil bypassed, the more aggressive damping becomes. 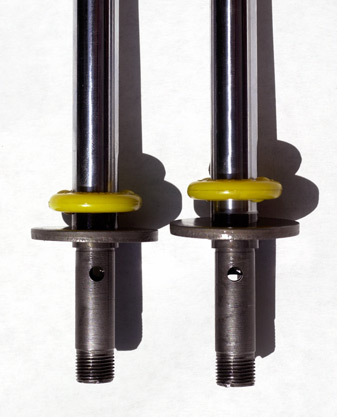 Two SRC damper piston rod assemblies with their valve stacks removed for clarity. The bypass valve is the hole in the shaft below the valve mounting plate. At left, the bypass is closed. At right, it's open. 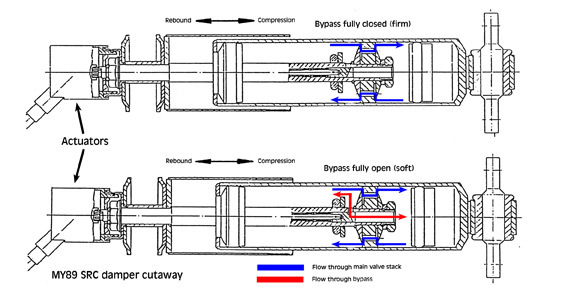 Diagrams of oil flow through the shock's valve stack and piston rod. Above is bypass closed and below is bypass open. Drawing: Bilstein Corp. of America. This bypass is a sleeve valve located at the bottom of the shock's piston rod. The tubular piston rod has a pair of holes in its wall, 180° apart. Concentric, inside that rod, is the valve shaft with a passage which runs vertically from its open end, up an inch or so, then T's to openings in the shaft wall which align with the holes in the piston rod. This is a rear actuator. The actuators, themselves, are the same but their wiring harnesses are different lengths. 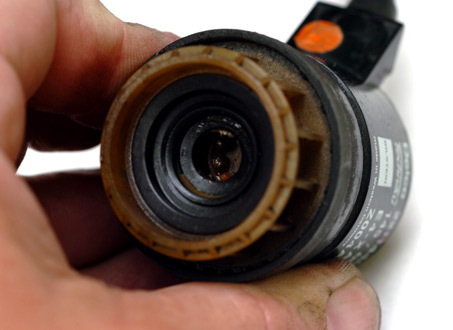 Front actuators can be used in the rear but rears cannot be used in front because the wires are too short. This is the business end of an actuator. Look close down in the center hole and you'll see the splines that engage the gear on the shock's piston rod top. Actuators attach to this crown-like actuator mount at the top of each shock. 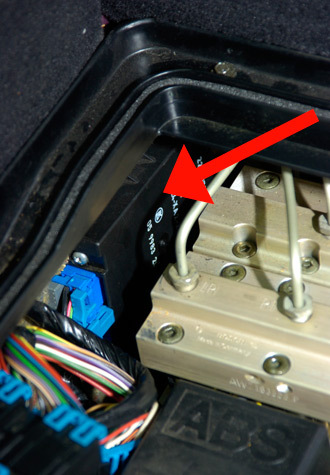 They are retained by a spring clip which goes into the slots on the side of the actuator mount. 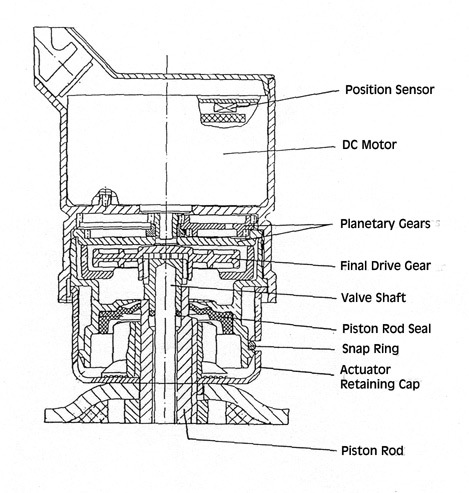 Actuators are fairly complicated devices, as this diagram shows. Torque is generated by the DC motor, multiplied by the planetary gear set and applied to the shock by the main drive gear. The SRC controller truly is a 'little black box'. It's attached to the side of the side of the well behind the driver seat and is just to the left of the ABS modulator. As the valve shaft rotates, the valve opening varies in size. The shaft is splined at the top and engages an "actuator," a bidirectional, DC motor with an integral, Hall-effect position sensor, which attaches to the top of the shock. The actuators are controlled by the SRC Module, or "controller", located in the well behind the driver seat. They rotate the bypass valves to one of a possible six discrete positions giving SRC up to six "steps" of damping. The position sensor feeds valve setting data back to controller. Selective Ride has two versions: '89-'91, "early", and '92-'95, "late". The late system has: 1) significantly less bypass (82° vs. 162°) travel. This quickened response because, while actuator speed was unchanged, the valves move half the distance, so they switch steps twice as fast, 2) two modes have less damping steps. Sport was cut to five steps and Performance was cut to four, 3) a revised controller, compatible with the changes in travel and steps, 4) a secondary valve stack in the bypass circuit which improves damping in the lower steps and 5) damping which is more aggressive overall because of lower spring rates for 1992. There's even a bit of a mystery surrounding the early system. In '89, Selective Ride (FX3) came only in combination with the Performance Handling Package (Z51), but when you ordered those two, in a strange twist, the car was downgraded to softer, base springs, stabilizer bars and front lower control arm bushings. In 1990, FX3 no longer required Z51 but, if you ordered both, again, you got base springs, bars and bushings. Unfortunately, this downgrade was not widely known. Many unsuspecting '89/'90 customers, wanting the stiffer springs and bars, ordered Z51 along with FX3 but never knew their cars had base parts. While there were 83 Corvette Challenge or World Challenge race cars built during those two model years with FX3 and "real" Z51 (a combination known to some as "R9G") they were not available to the general public. It was not until 1991 when a combination of SRC and the stiffer springs and bars was released. That was RPO Z07, available through 1995. 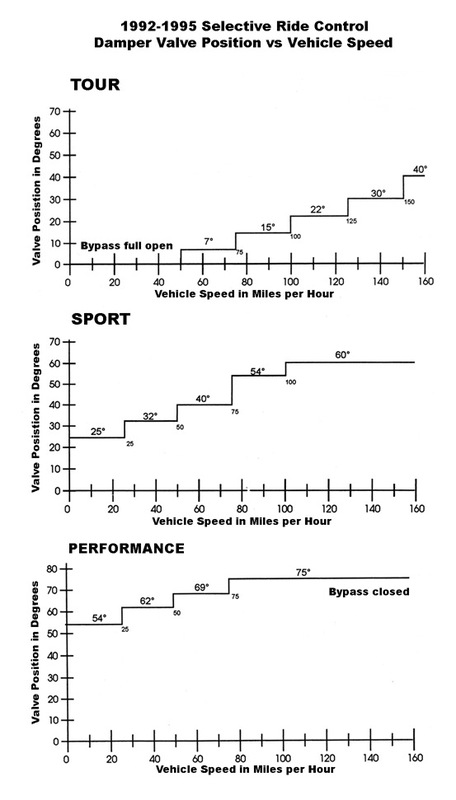 This chart shows bypass valve settings and various speeds in all three SRC modes for the early system. This chart shows the same data for the late system. We had to dig to find why this quirk existed. Scott Allman remembered FX3 and Z51 forcing base springs and bars but couldn't remember why. We contacted famed Corvette road racer and retired GM engineer, John Heinricy, who, starting in 1989, spent a few years as Corvette Development Manager. John told us that SRC was developed in lockstep with the ZR-1 which used spring and stabilizer bar rates of the base C4. Developing and validating a system as complex as FX3 took time. GM's resources were limited and prioritized, so work focused on the needs of the ZR-1, first. Heinricy told us that, since validating SRC for the base suspension came first, it took a while to do the same with the stiffer springs and bars so, in the interim, if you ordered both, you got base springs and bars. Once SRC was on the road in '89 and the ZR-1 in 1990, Corvette Development validated Selective Ride in combination with the more aggressive parts.